France Shooter Shouted, Allah Akbar! At least three people were killed and a dozen others were wounded Tuesday evening in the shooting in the historic French city of Strasbourg, which lies across the Rhine River from Germany. Strasbourg is well-known for its over-the-top Christmas displays and celebrations. According to Paris prosecutor Remi Heitz, witnesses reported hearing the gunman shout “Allahu Akbar,” Arabic for “Allah is the greatest,” during the onslaught. 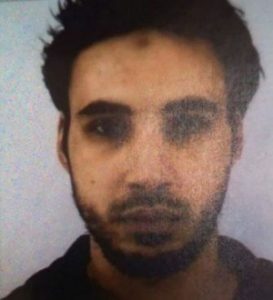 French police have identified the suspect in the Christmas market shooting in Strasbourg as Cherif Chekatt, 29 (seen in photo), a French citizen of Moroccan origin. The European nation has seen at least 27 attacks since 2010 carried out by Muslims. Globally, this year Muslim radicals have carried out 1872 Islamic attacks in 53 countries, in which 11,074 people were killed and 11,079 injured.